Draw the line . . . Used with its companion book, Boundaries, this workbook will provide practical, non-theoretical exercises that will help you set healthy boundaries with parents, spouses, children, friends, co-workers, and even yourself . . . by drawing on God's wisdom. Being a loving and unselfish Christian does not mean never telling anyone no. 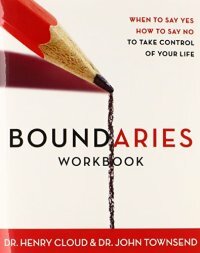 This workbook helps you discover what boundaries you need and how to avoid feeling guilty about setting them. It will give you biblically based answers to questions you have about boundaries.